Anna Allanbrook, principal of Carroll Gardens' Brooklyn New School, where 95 percent of families opted out this year. BROOKLYN — The state math tests kicked off on Wednesday, but you might not be able to tell at Carroll Gardens' Brooklyn New School — where nearly all of the students opted out of the exams. The progressive and popular lottery-based elementary school — which made a concerted and collective effort to eschew the state exams, forgoing any test prep this year — achieved an astounding 95 percent opt out rate this year, up from last year's 80 percent. 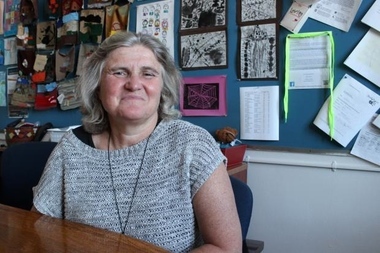 As a result, teachers will continue with the regular curriculum in their classrooms at test time, pulling out the five kids per grade who are taking the test and ushering them into small "calm" rooms where they can complete the exams, its principal Anna Allanbrook said. Dolores Swirin-Yao with her sons, Adam (left) and Jeremy. 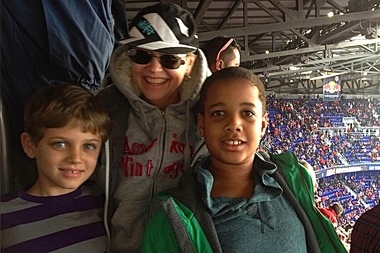 Adam, a fourth grader at the Brooklyn New School, opted to take the state tests this year. Jeremy, a fifth grader at Manhattan school for learning disabilities, did not. The school is at the forefront of NYC's growing opt out movement, as an estimated 3,124 students refused to take the test this year so far, up 64 percent from last year, according to the grassroots parent-led NYC Opt Out, which has been assisting families across the city who oppose the exams. Most opt-out parents in the city find themselves in the minority, with principals who pressure them to have their children take the exams, but at the Brooklyn New School, the tables are turned as test takers are the ones who feel "tremendous pressure" to fit in with the opt-out students, one parent said. "I feel like parents like me are being ostracized if they make the choice to take the test," said Midwood mom Dolores Swirin-Yao, who did not opt out her fourth grader, Adam. "We have a little support group." Swirin-Yao explained that "there are many things about the opt out movement that I believe in," such as protesting how much money go to the testing industry to companies like Pearson, or disagreeing with the tests' use in teacher evaluations. In fact, Swirin-Yao has a fifth grader with a learning disability at a Manhattan school, where the state tests are not administered, and if they were, she would opt him out since she feels standardized tests aren't approporate for him even with extra time, she said. But, she said, "I don't think the only way to send that message that there are flaws in the test is to not allow the student to take it if it's in his or her best interest. I think it should be up to the parent." Her son Adam was excited to take the tests at Brooklyn New School, she said. "My son happens to be naturally competitive and achievement-oriented and good at taking tests," Swirin-Yao said. "He took them last year and did very well and was not stressed out about it." He's also shy and she's not sure how he'll fare in interviews for middle school admissions, so having his test scores, she hopes will help provide a "more balanced view of who he is." While she wouldn't want her son to attend a school with "extensive test prep," Swirin-Yao signed him up for four sessions at a Brainy Academy "just so he could see what the tests were like and have some strategy," she said. Parents at schools across the city have expressed similar feelings of conflict over whether to opt out. Some feel that having test scores might help their kids if they didn't have great grades. And others were worried about not having scores for fourth graders and seventh graders, since those scores are often used by top tier middle and high school admissions. Principal Allanbrook has tried to dissuade parent fears over opting out and hoped to "educate" parents so they understood they had a choice in the matter as opposed to other schools where principals and teachers stymied any such dialogue. "This is not a school where we censor discussions," she said. "Ultimately, people should be able to make their own opinions." Allanbrook became a staunch supporter of the movement two years ago when she saw the tougher new tests aligned to the Common Core standards and didn't like what it meant for students or educators. "I've been a principal for a long time, and I'm not quiet about what I think is best for children," Allanbrook said. "In a sense, I would be lying if I said [the state tests were] good for kids." Allanbrook began actively encouraging opting out, calling the tests and their use as a tool for evaluating teacher performance and student assessment "fundamentally wrong," especially for students with special needs or English Language Learners. The school decided to skip test prep so its educators could continue "doing the good work we do," Allanbrook said, adding that the few students who did take the test wouldn't be wholly unprepared. "We do believe the way we teach does prepare students well because they do become good readers and writers [and good at math]." Ironically, kids who choose to take the test now actually have better conditions since they are in small groups, which makes for a less stressful environment, she said. With 32 kids in a room, if many kids finish early and are tapping their pencils, it's a lot more disruptive and nerve-wracking than when only five kids are taking the test, she said. Plus, the overall vibe of the school was "relaxed," since most kids weren't taking the exams, she said. Still, there could be ramifications for the school under intense state pressure to take the exams, Allanbrook said. Under the current testing protocol, if less than 95 percent of a school's students take the tests, it could be designated for having failed to make "Adequate Yearly Progress," according to guidelines. If this persists for three years, the school would not be considered "in good standing," which means it might be subjected to additional reporting and review requirements. Allanbrook said she's not afraid of the consequences and would welcome a review by education officials. Her school — which was No. 3 in the city for the sheer number of kindergarten applicants last year, a DNAinfo analysis found — has a "huge" waitlist and its students "have a pretty good reputation." "We feel if the state would come and monitor us they could learn a thing or two," Allanbrook said. "I think there's a reason we are popular. It's kind of our moral obligation [to be outspoken] because we can. We won't really suffer the consequence of other schools."